A Bury St Edmunds couple who made their first tracks in the ski-wear business ten years ago this month have marked their anniversary with a holiday for customers and are planning further celebrations over the May Day bank holiday. 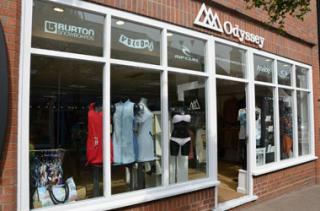 Chris and Caroline Woollam opened Odyssey in St Johns Street in April 2006. The couple had met at university in Swansea and after completing their studies, went travelling in Australia and New Zealand where their love of surfing and skiing inspired them to start their business on their return. Now ten years on, the shop has expanded to occupy premises twice the size of their original store and the business continues to grow, in particular the skiing side of the enterprise. Chris said: “When we decided to start the business we were in our mid-twenties and we sought the backing of The Prince’s Trust, which gave us credibility and meant we were taken seriously in what we wanted to achieve. We decided on Bury St Edmunds as I’d grown up here and although it’s a long way from beaches and mountains we felt that St Johns Street, which is known for its independent retailers was the ideal location. In the last ten years, as well as seeing the business expand into bigger premises twice, the couple have also married and now have two children aged five and two. But with the support of loyal staff, allowing Caroline, whose background is in accounts, to spend more time at home, their family has grown alongside the business growth. Odyssey’s most recent enterprise was to organise a skiing holiday for 21 of their customers – and it was such a success it may become an annual event. Now Chris, Caroline and shop manager Matt Rutherford are looking forward to the summer season and a long weekend of anniversary celebrations. The shop can be found at 14-15 St Johns Street, Bury St Edmunds. The 10th anniversary celebrations will be taking place over the weekend of 30 April – 2 May during which they will have special discounts and promotions in store, as well as a prize draw with spectacular prizes from all their best loved brands including Burton, Oakley, Rip Curl and more. Refreshments will be provided so pop down and wish them a happy birthday if you are out in Bury St Edmunds over the bank holiday weekend.